Tuck yourself in and wait for the sun to set, because Mov’in Bed is now on! 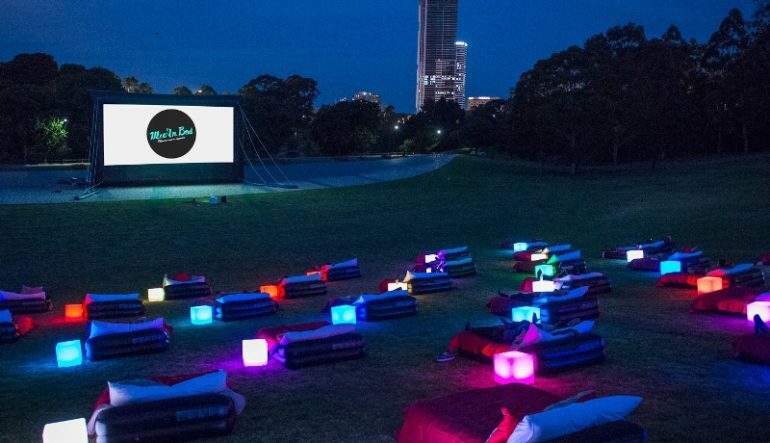 This is easily one of the best cinemas in Sydney and is in fact the world’s biggest outdoor bed cinema as of 2017, with 150 beds to kick back on complete with pillows, bedside lamps and blankets. The film series runs from 27 October to 10 December at Entertainment Quarter in Moore Park, so it’s easy to get to no matter where you’re staying in Sydney. What’s playing on the big screen? You can expect a little of everything this year. The team behind Mov’in Bed loves mixing things up so the selection ranges from Blockbusters to horror flicks, to everyone’s Disney favourites. There are also some great Japanese animated movies and international choices with English subtitles. We can’t wait to catch The Artist on 23 November and the beloved classic Titanic on 10 December. There really is something for every taste. If you love snacks while watching flicks you certainly won’t be disappointed at Mov’in Bed! You won’t even need to leave your bed to enjoy a range of tasty treats delivered from pop-up restaurants including Bavarian Bier Cafe, Burger Project and Fratelli Fresh, or you can keep things traditional with popcorn and lollies. You can also relax with a wine or a beer in hand too. You don’t need to bring anything at all other than some warm clothing in case the night turns cool. Each bed fits up to three people, or you can bring your own picnic blanket if you prefer. On 17 November there’s a bunch of free grass-area tickets up for grabs to celebrate Martin Scorsese’s birthday, and on 9 December it’s Quentin Tarantino’s turn with a Kill Bill Volume 1 and 2 marathon complete with a DJ set. If you’re looking for somewhere central to stay in the next few weeks, our Campbell Street, Zetland, Waterloo and World Tower suites in Sydney offer perfect accommodation close to the Entertainment Quarter at Moore Park. Meriton Suites World Tower is actually Sydney’s tallest residential building with incredible city views, giving you another treat for the eyes.